Dear Explorers ! 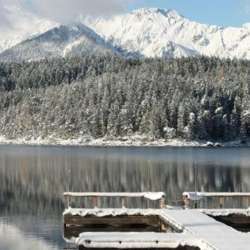 The Eibsee is also beautiful in Winter , so get on your cozy and warm clothes and let´s go for an adventure in the outdoor , resembling the Canada woods and landscapes in Winter! . The route is almost flat ( ~200 m heigth difference over many km , almost unnoticeable ) . Let´s feel for a while like in the polar circle ! . The route could be like this Protected content except that we will start in a prior point. It will be snowy everywhere in the alps ( also in München) so a good point to enjoy the nature. However the temperatures are milder than weeks before ( around 0C and above during the day and for the place) . We go by train and we share the cost for getting cheaper group rates. Don´t get your own tickets, I will do it when we are at the meeting point. bring cash to facilitate the change back Protected content banknotes and some 50c Protected content coins) once on the train. The starting point cannot be changed.so don´t ask it this time again like usual please :-) if you are not commiting to the starting point , please leave your place free for other participant (participants are those who are at the starting point defined in the activity) and eventually inform us that you are going to met us. Your responsibility to do it in such case. I can not look for you for organizatory reasons or report you about changes and incidents on our schedule. COMMON SENSE to get the items you will need :-). 1) clothes that keep your whole body ( remember hands and ears, etc ) warm and dry during a snowfall and walking on the snowfields, for instance sky clothes. No jeans or other textil that will get you drenched after 1 hour walking and the rest of the day. Remember also the posible winds, when picking up your clothes. Eventually glasses againt the wind/snowflakes. 2) minimal physical condition to walk for hours in paths that are covered with snow and where you might sink your feet deep on the snow at every feet. You can bring your own snowshoes if you fear it or be fit enough otherwise. You don´t need prior experience hiking for this route. 3) some food just in case. There is a hut at the lake sea side at the end of our round. Water will be usefull. 4) think about what you are doing. You know where are you going and you are responsible for yourself. This is a peer to peer activity. Everyone is responsible for his/her own safety.